Who who have thought that the BMX bike that was so in during the 80's will be an Olympic event. I distinctly remember seeing improvised ramps (courtesy of my husband)in front of our house for his BMX biker pals. On and on they go swooshing and swishing up and down the ramp, doing tricks and turns and whatever. I used to get real mad for they do stunts without helmets or pads. 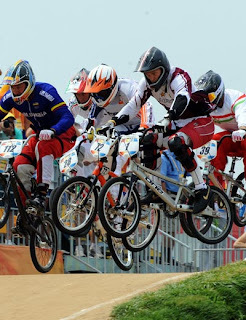 Anyway the BMX cycling debuted in Beijing. The event is mostly racing/best time in the moto cross. Quite fun to watch actually. k5ino: i emailed you but my mail returned with a prompt "no such user"
I got the same comment on my blog. Did you ever have any success contacting?